Windshield repair versus windshield replacement. 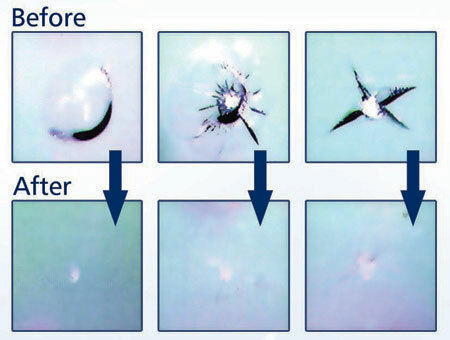 Most rock chips under the size of a 50 cent piece can be successfully repaired. The results vary depending on the condition of the break. Length of time since the break occurred - new breaks repair better. A break that has been wet - moisture in the glass affects the repair. If the break is directly in your vision and bothers you, it may still bother you after the repair. A successful repair is designed to improve the look and keep the damage from spreading. Repair is an economical alternative to replacement. Our repairs are guaranteed forever. If, at anytime, you do not like the windshield repair, or your windshield continues to break, we will give you a full credit on the repair toward a new windshield. AGA is a locally owned and managed company offering quality auto glass repair and replacement service throughout Southern Nevada. It is also approved by most insurance companies and the finest car dealerships.